Everything is in your reach on the Hill. We think crimson and blue would look good on you. If you agree, consider applying to KU. Learn more about the application process, tuition rates, applying for scholarships, and admission requirements at admissions.ku.edu. Fandom is rooted in KU history—our first basketball coach was the sport’s inventor, James Naismith. When you join in our immortal Rock Chalk Chant, toss a handful of confetti at a basketball game, or celebrate by Waving the Wheat, you realize that Jayhawk spirit isn’t just witnessed—it’s experienced. 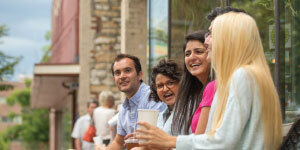 Living on campus means everything is just around the corner: your next class, dining options, even a night out. Plus, students who live on campus are more likely to earn better grades and graduate on time. It’s a win-win. In total, we have 25 student housing sites on campus, including residence halls, scholarship halls, and apartment living. 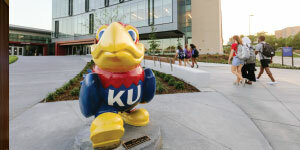 Find your perfect option at housing.ku.edu. We think you belong here, but don’t just take our word for it; come see KU for yourself. A visit to our gorgeous hilltop main campus will provide you with crucial information and unforgettable moments. Plan your visit today at visit.ku.edu. In 1866, the University of Kansas welcomed its first class of 55 students.Today our enrollment approaches 30,000. From a single building, we’vegrown to 13 schools and five campuses: the hilltop campus in Lawrence, the Edwards Campus in Overland Park, and medical branches in Kansas City, Wichita, and Salina. We embrace our role as the state’s flagship university and a premier research institution, serving the state, nation, and world. We celebrate the energy and compassion that infuse the Jayhawk spirit. And we remain true to our historic values: the elevating force of education, the transformative power of research, and the healing power of service. As a student at KU, you’ll join a Jayhawk legacy of scholars, artists, innovators, athletes, and world leaders. Whether you know exactly what you want to study or are considering several majors, you’ll choose your own path. 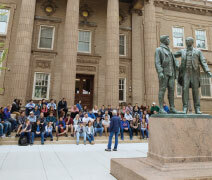 At KU, no student is undecided—rather, they’re exploring. And we have a lot to explore. Withmore than 400 degree and certificate programs and 5,000 courses, you’re bound to discover something thatignites your passions and sets you on track to your ideal career. Call us biased, but we consider Lawrence a perfect college town. Founded by abolitionists in 1854, Lawrence has carried a tradition of freedom and individuality through generations. Today the city is a crossroads of culture, celebrating the artists and innovators that populate its history and create an unmistakable identity. Walk downtown to Massachusetts Street—we call it “Mass”—and you’ll find celebrated dining, boutique shopping, and a variety of art and performance spaces, including more than 30 music venues alone. If you’re a natural explorer—most Jayhawks are—the city has over 100 miles of trails and 54 city parks. Plus, you’re only a 45-minute drive from historic, bustling Kansas City. Around here, you’re never far from a new experience.